Brexit is not only a regional affair. The Brexit vote of 2016 came as a powerful reminder that progress in economic integration can be reversed. And the raging debates in the UK parliament come as an equally powerful reminder that Brexit never was the easy choice its advocates suggested. To be or not to be is never an easy question, and even less so in an interconnected world. Brexit is not only a regional affair. Once the UK has left its 27 European Union (EU) partners behind, that will alter the ability of non-EU countries to export to the UK. This is not a minor issue. In 2018, the UK was the fifth largest importer inside the EU, with almost $680 billion worth of goods, half which came from the EU, and it is an important trading partner for developing countries. How Brexit affects other countries will depend first of all on the form of exit. In the short term, an orderly Brexit would be less disruptive. For example, there could be an implementation period of almost two years, with the UK being treated as member of the EU for the purposes of international trade agreements. This period would also give time to the UK and third countries to define new agreements. However, a no-deal Brexit would significantly alter market access conditions to the UK. In such a scenario, EU preferential trade agreements with third countries will abruptly cease to apply. And imports to the UK could end up taking place on Most Favored Nation (MFN) terms – the WTO principle that the same tariffs must apply to any trading partner, unless there’s an exception set out in an actual trade agreement. There are already indications that some MFN tariffs will be reduced, as the UK government may want to contain inflationary pressures from higher import tariffs. In a no-deal situation, countries enjoying preferential access to the UK market, such as EU members, would see their advantage eroded because they would face the same MFN tariffs as their competitors. In contrast, countries facing relatively higher tariffs would benefit from possibly lower MFN tariffs. Recent UNCTAD research estimates that the largest losses would be sustained by countries that are more integrated with the UK. The chart below shows the main winners and losers. The EU is expected to lose about $35 billion in exports to the UK market. Other countries, such as Turkey, South Korea, Pakistan, Norway, Iceland, Cambodia and Switzerland are also likely to see a decline in their exports. 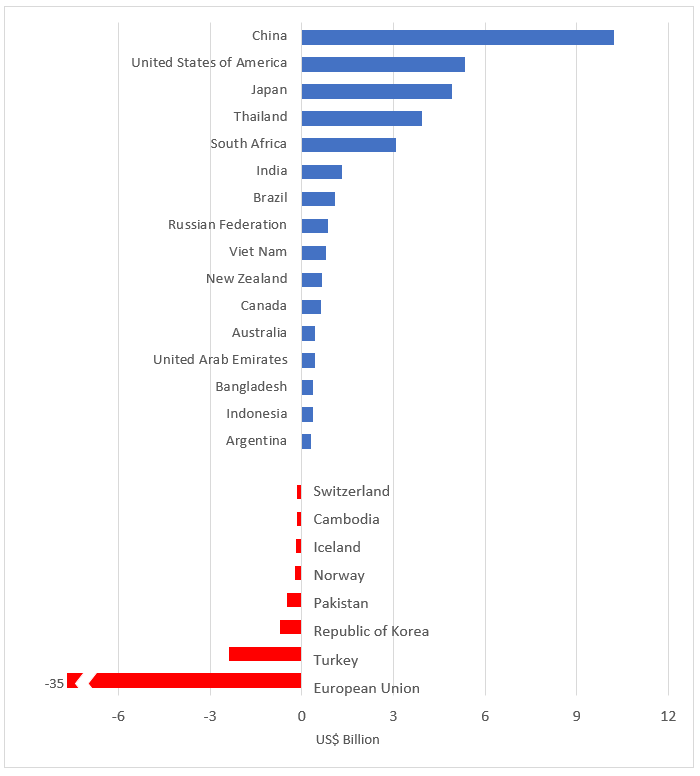 Others who are currently facing higher tariffs will win, particularly China, the US and Japan. Brexit will not only impact large economies, but even more so small countries with a relatively higher level of exports to the UK market. To minimize the negative consequences for them, the UK should accelerate the signing of trade continuity agreements and maintain unilateral preferences. More importantly, the UK’s MFN tariffs on what are often key important exports from low-income countries, such as sugarcane or bananas, should not be substantially reduced. The Caribbean region is a good example of how the continuity agreements can substantially reduce negative effects of Brexit. CARICOM countries and the UK recently signed a continuity agreement to mirror the CARIFORUM-EU Economic Partnership Agreement. This agreement allows CARICOM countries to freely enter the UK market and prevents a massive fall in the region’s exports to the UK under a no-deal Brexit. In the absence of such an agreement, Guyana would have seen the largest drop in its exports to the UK, of over 80%. Similar effects are found for most of the CARICOM countries. In contrast, the many countries that have still not signed continuity agreements are expected to bear high costs from Brexit. Countries like Nicaragua, Ghana and Honduras would see their exports to the UK fall by nearly 40% without a continuity agreement. Still, preferential access to UK markets may not be sufficient for many low-income countries. In the case of Cambodia, changes in UK MFN tariffs could negatively affect Cambodia’s exports even if the country retains free access to the UK market because of its Least Developed Country (LDC) status. The lowering of the UK MFN tariff would erode Cambodia’s competitiveness vis-à-vis foreign competitors, resulting in a substantial reduction of its exports to the UK, of about 12% . And this is not an isolated story. Other LDCs may see their exports to the UK drop in the case of a no-deal Brexit: Madagascar (-14%), Mozambique (-32%), Myanmar (12%) and Nepal (-20%). A no-deal Brexit would have immediate repercussions for many developing countries’ exports. However, valid concerns also exist even in the case of a more orderly Brexit. Third countries’ exports to the UK will depend on the UK’s new trade regime – in relation to countries which currently enjoy preferences in the EU market and also in relation to potential new MFN tariffs. The UK has expressed its willingness to replicate EU trade concessions and to pursue bilateral agreements to replace those of the EU. But will does not replace reality. The EU has over 70 trade agreements and as of March 2019, the UK has signed continuity agreements with relatively few countries. In these circumstances, the best response from developing countries is to accelerate negotiations to replace agreements, especially on hot issues that go beyond tariffs, including rules of origin, non-tariff measures or quotas. This would perhaps be a powerful reminder not only to the UK, but to the rest of the world, that unwinding economic integration is not only complex, but that doing so altogether is a bad idea.